The First Grain Elevator in Chicago, 1838. The first shipment of wheat from Chicago was made in 1838 and consisted of seventy eight bushels. Prior to that time the residents of the city had consumed all of the grain sent in from the surrounding country, but after Newberry & Dole made that first shipment from the city that was destined to be the grain market of the world, they found their trade increasing and decided to build an elevator in.which to store the grain until it was shipped. 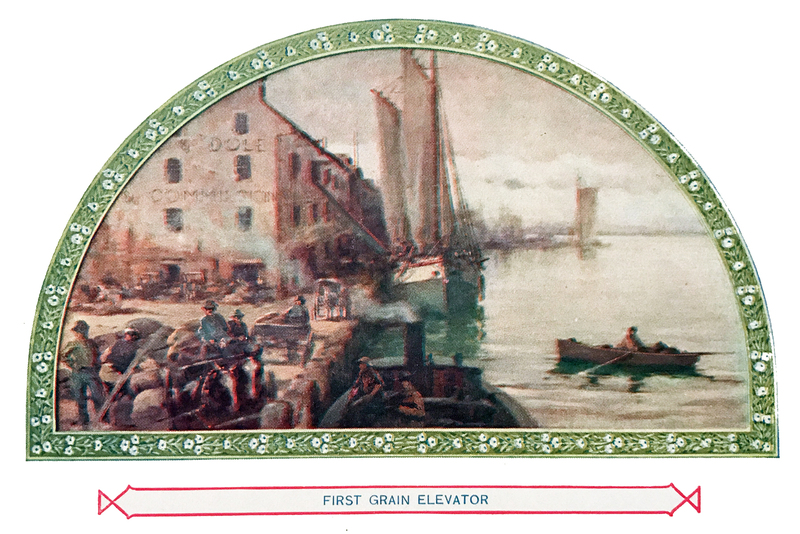 It was not a large or pretentious structure, that first grain elevator, but it was the forerunner of the elevators of Chicago, which last year held more than 91,000,000 bushels of grain. When Newberry & Dole had built their elevator in 1838, the wheat was hoisted to an upper story by hand-power, and when they received orders from the East for 3,678 bushels a very gratifying increase in the business from seventy – eight bushels of the previous year the wheat was run down a spout to the deck of the schooner Osceola, and Chicago’s grain business was then reallv begun. In 1841 the shipments had increased to 40,000 bushels, and in that year a new elevator, operated by horse-power, was built. The animal operated the machinery through the agency of a treadle, and when the treadle was removed to an upper story it was necessary to haul the horse up also with ropes and pulleys. The first steam-power elevator was built in 1854 by the firm composed of George Dole and George Armour. They built on the south branch of the river a structure 312 feet long, 80 feet wide, and 130 feet high much more like the monster elevators of to-day than was the humble building of Newberry & Dole in 1838. When this steam-power elevator was constructed in 1854, the shipments of grain from Chicago had reached a total of 13,132,501 bushels quite an advance from the seventy-eight bushels of sixteen years before. All of this grain was carried to the East by a large fleet of lake schooners, and the tariffs for freight were so high that in some cases the vessel owner drew one-half the sum for which the grain sold in Buffalo. As is well known, Chicago is now the grain market of the world.